When I started this mapping project four years ago, I had no idea how intensive of an effort it would become, nor did I realize there was so much ancient Korean history north of the DMZ just waiting to be mapped. So to celebrate this anniversary, I'd like to share with you some of the ancient sites and fortresses I have found in North Korea. I was able to map 213 locations (including additional wall segments of otherwise known sites). Of these sites, I can't find any information on at least 2/3rds of them. I have found several tombs as well, but those aren't part of this data release because they're part of the larger "burial mounds" section of the main mapping file and will be released in due time. Those 213 sites are in addition to the 113 sites found by Curtis Melvin's "North Korea Uncovered" project. Many of them, likewise, aren't identified other than their location. Using satellites to search for archaeological sites was pioneered by Dr. Sarah Parcak, particularly in Egypt. And while the purpose of #AccessDPRK wasn't just to find ancient sites, having literally looked at every square mile of North Korea, I have been able to help fill in a lot of holes in this part of the world and I look forward to the experts providing the details one day. You can download the full Google Earth file with all 336 historic North Korean sites at the bottom of this article. It also includes 56 ancient forts and city walls in South Korea! (This map shows you the general locations of all 336 archaeological sites. When most people think of Korean history, they focus on the Korean War, or perhaps, look as far back as the occupation by Japan which began in 1910. However, just like their neighbors China and Japan, Korea's known history dates back thousands of years. Unfortunately, that relatively modern event of Korea's division and war did mean that whatever history that had touched the northern half of Korea was, in many meaningful ways, lost to the West. Undoubtedly there are scholars both north and south that know about most of these places, if not all of them, but for those of us without advanced degrees in Korean archaeology, many of the places I have found are enigmas. First, I would like to give you a quick primer on pre-1900 Korean history starting with the Three Kingdoms Period. The Three Kingdoms Period, which began in 57 BC, was when the Korean Peninsula, and part of what is now China and Russia, was dominated by three kingdoms, the largest of which was Goguryeo (and it encompassed all of modern North Korea). 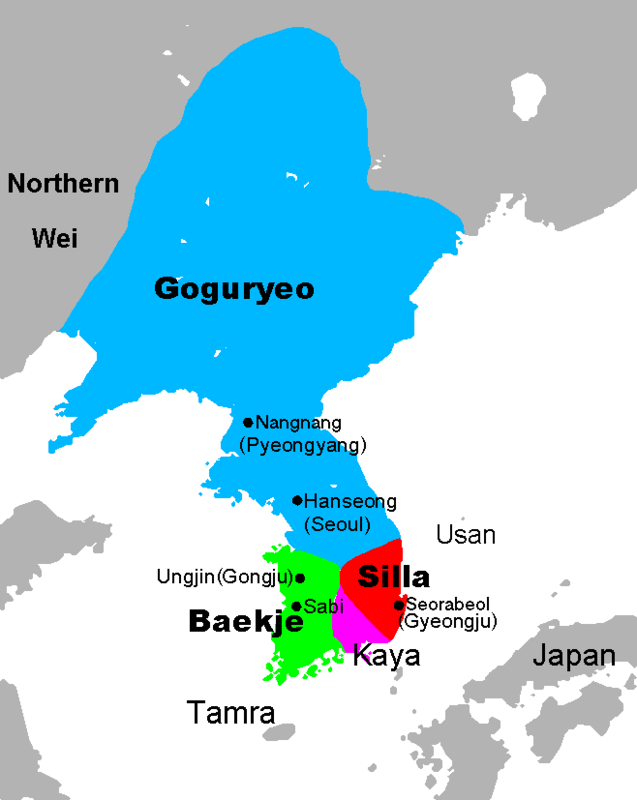 The other two were Silla and Baekje, along with a few small tributary states. The period ended when Silla, aligned with China, conquered Goguryeo in 668 AD. During those turbulent years, a "great wall" of Goguryeo was constructed that extended from Bohai Bay, moving northeast 300 miles to modern-day Nog'an County in China. It is important to note that for centuries, the history of Korea was strongly influenced by the machinations of China, and at times, the nominally independent Korean kingdoms were still client states of China. What followed the end of the Three Kingdoms Period was a two-state system, Balhae in the north and Silla in the south. Both states existed until the unification of Korea under the Goryeo dynasty in 936 AD. In the 11th century, the Goryeo built a second "great wall" (both of which are called Cheolli Jangseong or Thousand Li Wall). Like its northern predecessor, it too stretched for 300 miles, except its course was more or less west to east and was entirely within the territory of today's North Korea. During all of this history, various defensive walls, forts, and fortified settlements were constructed all over Korea. There were likely fortified settlements built prior to the Three Kingdoms Period as well, but I can't find any information about them. Here's the official list of the "National Treasures of North Korea". While these places are in North Korea, I have to stress that these sites are part of the history of all Koreans, and indeed, the world. Korea's distant civilizations and their advances mirror the great leaps in China, the Middle East, and Europe and should be preserved. Perhaps in the future, as we hope for bettering relations between the DPRK and the rest of the world, and even hope for unification, these sites will become known and fully researched so that another chapter of human history can finally be completed. North Pyongan Province has the most sites with 98. I have marked 71 and Melvin marked 27. Excluding fortress walls, I've mapped out around 50 miles of long defensive walls. These walls are roughly broken up into 3 main lines. Two walls run parallel to each other in the north and a third is located farther south near the border with S. Pyongan Province. These walls follow the contours and peaks of mountain ranges. There are several fortresses and walled cities in N. Pyongan. The most impressive is the ancient city of Yongbyon. That name may sound familiar to you because the Yongbyon Nuclear Facility is located nearby. National Treasure number's 46-50 are located here. The single densest archaeological region is near the city of Sinuiju. With tensions currently very high between North and South Korea, and South Korea having recently closed the Kaesong Industrial Region (which is a joint-venture physically located in North Korea), I'd like to move south to the city of Kaesong. Kaesong has a very long history and served as the capital of Goryeo between 919-1394. 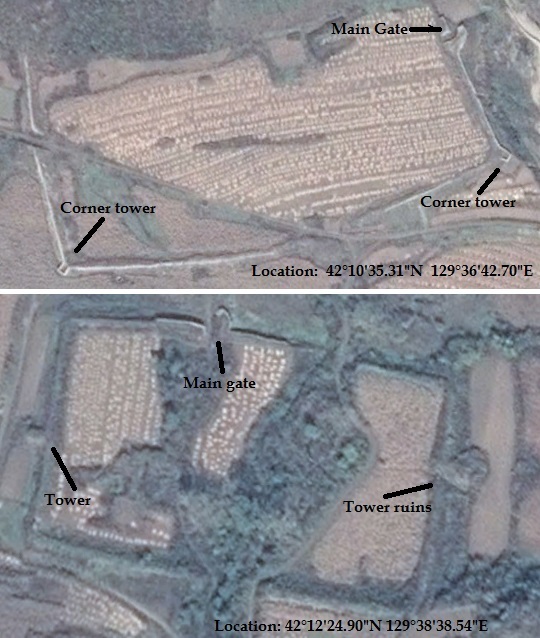 Many historic sites in North Korea are at risk of being destroyed, particularly those in urban areas. Portions of Kaesong's old wall (Nat'l Treasure Nos. 129/130) have been destroyed due to mining. Similarly, the Kyongsong walled city (National Treasure No. 118), is at risk. Three roads have cut through the wall and a sizable portion of the southern wall has completely disappeared as houses have been built there. Near the city of Munchon, Kangwon Province, there is a hillfort and a long wall running west. There are 24 sites in North Hamgyong Province and I was a bit surprised by how many there are. The northernmost portions of Korea have long been given the lowest priority, both during the imperial era and during the DPRK regime. Although, I suppose if you do treat a region poorly, you might want to build some forts to keep the peace. The northern part of the valley where the town of Komusan sits, splits into two smaller valleys. Each one holds a fortress (less than 3 miles apart). One of the forts has had its northern wall demolished for a rail line to go through and the other fort has a lot of damage from centuries of erosion. One of the most interesting sites is actually located in the Hoeryong Concentration Camp (Camp 22). The small adjacent village is called Haengyong and so I have dubbed it Haengyong Fortress. The site is where the camp administration buildings are located. Moving on to cultural sites, located throughout the country are small temples and shrines. These are the remnants of a former deeply religious civilization. During the establishment and consolidation of North Korea's atheistic regime (unless you count their personality cult), Kim Il Sung had many places of worship destroyed. Fewer than 300 remain and the majority of those have been abandoned; some are still "active" as cultural relics. Here are two typical sites. Both are in North Hwanghae Province and are nestled in the mountains away from populated areas (which might explain why they haven't been demolished). The last place I want to show you is Kyongsong Hyanggyo. Located half a mile from the city walls of Kyongsong, the site is an old civil school. These were part of a system similar to the Chinese imperial examination system. These schools were where members of the Yangban (elite class) would go to become civil servants and bureaucrats. Various schools were created between 918 and 1392, and 1392 to 1897. According to older imagery, the main building was damaged and then reconstructed around 2009/2010. All 392 sites mapped in Korea. 336 for the North and 56 for the South. To access all 392 ancient sites in Korea, you can either visit my file archive here and click the download button for "Koreas Ancient History_Final_2-9-17.kmz" or download it directly by clicking this link. To view the places you must have Google Earth. You can use the hashtag #AccessDPRK when discussing on social media.